This image was based on a dream I had shortly after my mockingbird "Chopra" came into my garden and my life almost two years ago. He has visited me every day since and he has been a great inspiration and my little "teacher". The dream took place in San Francisco. I was looking up at a stained glass sign hanging above a business. The young woman in in the sign is listening to the mockingbird. It is said that the mockingbird spirit totem teaches the power of voice. It will help you to find your lifes purpose and give you the courage to act on it without fear. The mockingbird can help you realize your inner talents. 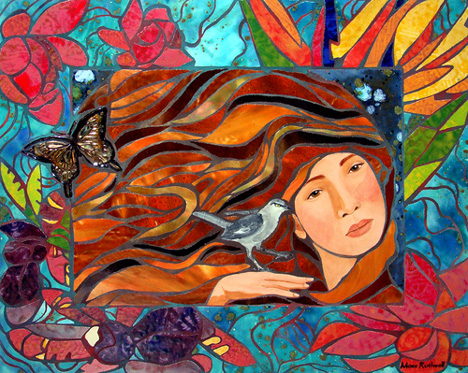 In this piece, I experimented with multiple glazing techniques and I used many different colors of grout to bring the art piece together.